Choose the decal colour of your VIAL evo XC! Choose the bar width of your VIAL evo XC! Choose the stem and the stem length of your VIAL evo XC! Choose the crank length and chain ring ratio of your VIAL evo XC! Pick the saddle of your VIAL evo XC! If you need help in defining your frame size or with any of the other dimensions, you can upload the filled-out bike fit chart here. VIAL evo XC - our interpretation of the perfect rail hardtail! Based on its road equivalent, the VIAL evo D, the best road bike of the world of the years 2014, 2015 and 2016 (source: RoadBIKE magazine), we are now sending our first MTB frame offroad to here as well take the trails of the worlds by storm. Its sensationally low weight of just 870 grams (size M) as well as its aggressive geometry give the VIAL evo XC an unmatched reponsiveness and agility. Regardless of its low weight, the primary development targets have been safety, stiffness and riding pleasure. This split has been mastered thanks to the utilization of the latest high-grade materials and production processes, such as the lamination in clean rooms and autoclave curing - 100% handmade in Germany! 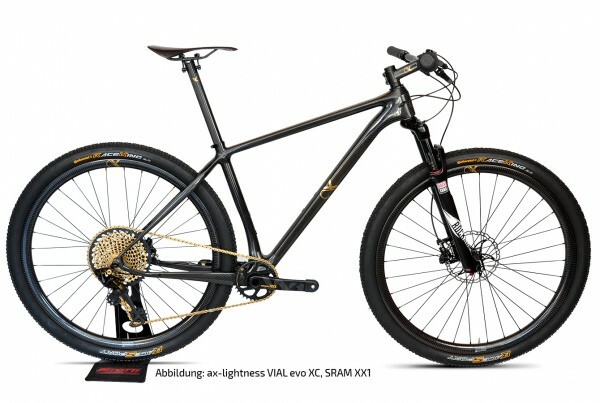 The new in-house test bench as well as the expertise of the new owner of ax-lightness composites Bernd Nolte and his team allow the VIAL evo XC to yield stiffnesses that easily surpass those of frames with twice its weight. The EFBE-certificate attest its high level of safety, stability and durability. The riding sensation, which already is predetermined by the low weight and ample stiffnesses gets its icing on the cake thanks to its super modern race geometry: Super short chainstays of just 427 mm bring the weight far over the rear wheel and result in an unprecedented traction and agility. That way even in the steepest and loosest terrain there still is enough grip to propel forward pedaling. The long reach and short head tube allow for a race-worthy seating position. The sleek head angle of 68.5 deg takes away the tendecy of a twitchy, nervous handling due to the backwards orientated weight distribution and yields a superb agility and safety-inducing smoothness. The front wheel is unloaded which makes the front suspension work more efficiently but still keeps enough weight on the front wheel to master the steepest climbs yet reduce the tendency of a nose-over in steep descents. VIAL evo XC, handmade in Germany, to take the trails of this world by storm! Completed with Sram's latest XX1 Eagle 12-speed groupset as well as ax clincher wheels and components, the fully raceworthy "VIAL evo XC - Sram XX1 Eagle 12-speed" achieves a weight of an unbelievable 6.9 kg, right at the UCI weight limit. Lighter, stiffer, faster - VIAL evo XC! This bike not only looks absolutely cool, weighing in at only 7 kg, is barely heavier than the lightest road bikes. It's also a masterpiece of styling"
Every ordered bike is custom built and assembled for the customer. Our configurator allows you to customize the bike to your preferences. We are happy to help you with the choice of the correct frame size and the dimensions of the parts! For this you can download our attached bike fit chart and upload it directly to the order during the ordering process. Headset: ax Tapered 1 1/8" - 1 1/2"
Customer evaluation for "VIAL evo XC, SRAM X01 Eagle"